Rose Innes Nursing Home, Aberchirder. Plans to build two houses on the grounds of a former care home have been recommended for refusal. 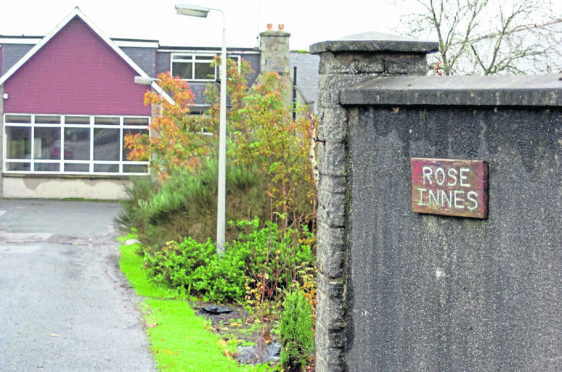 The application for the Rose Innes Care Home in Aberchirder will be considered by the Banff and Buchan area committee next week. The Aberdeenshire Council-run facility closed its doors 12 years ago after failing to meet Care Commission standards. After lying vacant for a decade, the property was placed on the market in 2016 with planning permission to convert the site into 12 flats approved in March. It reappeared on the market for £350,000 in May despite the fact work had already begun to divide the building. The planning application was lodged by Banff-based Mantell Ritchie architects on behalf of the new buyer EDTW Property Ltd in September. It proposed two semi-detached houses containing three upstairs bedrooms with a fourth bedroom/dining room and a garage. A new access driveway would be created on to Main Street for the exclusive use of the owners of the properties. Planning officers have, however, recommended the committee reject the planning application due to it not being in accordance with the character and appearance of the conservation area. The report prepared for the committee by director of infrastructure services Stephen Archer said: “The key planning issues are the principle of development, the layout, siting and design of the development given its context within the conservation area, in addition to technical considerations. becomes particularly important in the assessment. The building was originally opened in 1900 as a hospital and ended up a residential care home in 1960 for almost five decades. The council’s built heritage team, which considered the development, stated: “The dwelling houses also incorporate a palette of non-traditional materials with dry dash walls, concrete tiles and UPVC fittings which all conflict with the principle of enhancing the special quality of the area. The application will come before the Banff and Buchan area committee for a decision on Tuesday.